Once you have selected your wetsuit you need to care for it properly to get the most use out of it. 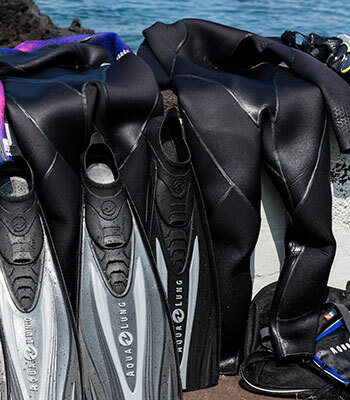 There are a few things that you can do before a dive that “care” for your wetsuit. You can wax the zipper with Ziptech from Gear-aid. You can use this product on any zipper that might stick, such as your dive bag. This will make sure your suit zips up and down with ease. Another great product is one from 500 psi called Wet/Dry Suit Slide to help with donning and doffing the suit. I personally love this product for my 8/7mm wetsuit. Some divers recommend using a plastic shopping bag over hands and feet to help get into the suit, but there really no comparison, and we are trying to keep plastic bags out of the ocean. With Wet/Dry Suit Slide you can continue to work the suit and shift it until it is perfectly on. In addition, if you have not worn the suit in a while you can stretch the neoprene for easier donning. Whether or not you admit it, divers are known to, um, ahem, relieve themselves underwater. This requires some cleaning. There are also millions of bacteria in seawater. When this bacterium is removed from the liquid world it will die and will begin to create a very unique scent. DON’T THROW YOUR SUIT OR BOOTS INTO THE COMMUNAL RINSE BIN UNTIL EVERYONE HAS HAD A CHANCE TO PUT THEIR LIFE SUPPORT EQUIPMENT IN, aka regulators. This should be self explanatory of the hygienic nature. At a minimum, if you are diving multiple days you can rinse the suit while wearing it with a hose while still on the boat. Rinse the suit in a tub of freshwater. Then using Gear-aids Wetsuit Shampoo hand wash the suit agitating gently for a few minutes removing any sand and dirt. This shampoo keeps the suit very soft and rejuvenates the neoprene. Now, hang in the shade and let it air dry. There are special wetsuit hangers, I like to use cut up pool noodles to create softer edges so as not to pull the wetsuit shoulders out of shape. Once it’s dry you can lightly spray the suit with silicon spray to keep the neoprene from dry rotting or cracking. If you experience a small hole or minor tear you can repair it yourself. Gear-Aid’s aqua-seal is renowned for its uses. For a hole, you can simply put a drop on the cleaned neoprene, lay flat and let it dry. For a tear you may want to use a piece of scrap neoprene to cover the tear, if the tear is longer than about 6 inches, the repair may either not last long or ultimately be too bulky to be comfortable. Most avid divers have multiple suits; some have seven or even more. You will use a suit for a number of years and feel it no longer keeps you as warm as it once did. You can add a new suit to your inventory and use the older one when the weather is warmer, or even on muck dives, getting more years out of both suits. Once the suit is “Swiss cheese”, you can cut what scraps could be used for repairs and toss the rest.